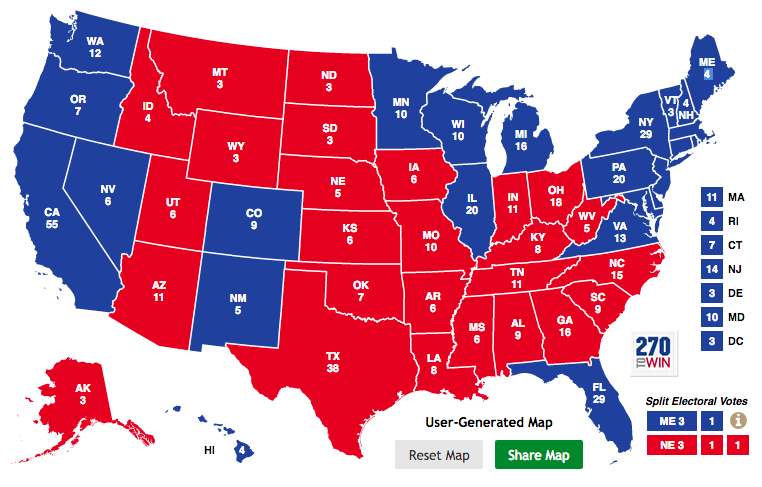 For my first Blog post in a while, I'm offering a prediction for today's US Presidential Election. The vast majority of predictions have Hilary Clinton favoured heavily as the winner. Even the usually highly cautious 538 forecast (ran by Nate Silver) now has a Clinton win predicted with over 70% probability. Other forecasters are ranging in the high nineties, with some as close to 100% as their mathematics can allow. For an excellent overview of what each of the prediction and betting markets are saying, this piece by Dr. Steve Fisher at Elections Etc is an excellent resource. My prediction isn't the result of a mathematical model, just my reading of state level polls and other prediction houses and betting markets. Principally, I am also calling a Clinton victory (no surprise there), but with a slightly higher Electoral College count than 538, closer to some of the less-cautious alternatives. My map of projected outcomes (put together using 538's prediction tool) is below. In terms of the popular vote, I'm expecting Clinton to fetch just shy of 50% to Trump's 45%. My projection actually hasn't changed in about a week, since the impact on the polls of the latest round of negative Clinton news bottomed out and favourable state-level polls came out for Clinton in many key states. Donald Trump seems to have recovered from scares in Arizona and Georgia, and looks solid in Ohio, so I'm predicting him to win there. Since Trump seems to be doing well in the Buckeye State, I also expect him to cling on to North Carolina in a Romney-like fashion. This is the state I am least certain about, but early turnout information from this key battleground seems to suggest a decrease in black voters heading to the polls, which won't be good news for Clinton. Contrary to some expectations, as well as holding on to New Hampshire, Michigan, Virginia and Pennsylvania, I believe Clinton will sweep up in all three of Colorado, Nevada, and Florida. The latter is by far the least certain, with most polls on a knife edge. However, an increasingly ethnically diverse electorate which appears to turning out in high numbers is encouraging news for Clinton. This is the same trend which looks to be delivering Nevada for her. Such is the nature in which the States are likely to be called over the course of the night, by my prediction the contest will be all but over by 1am GMT when Florida comes in, with Trump's path to victory pretty much closed at that point. And here's one to look out for: although I'm not predicting it to come in, I have a little bet on Evan McMullin to win in Utah.